A movie legend on the loose in New York City: Part 6 of our Fire! serie. What eventually became Universal Creative and the Totally Fun Company partnered on Kongfrontation, the headliner attraction of the new park. Peter Alexander was the man in charge of developing this unique experience. Starting with the groundbreaking King Kong Encounter from the Studio Tour at Universal Studios Hollywood, a second encounter with King Kong was added. To add to the thrill factor, an all new ride system from Arrow Dynamics was designed and who then subcontracted the fabrication to Intermountain Lifts from Utah. Using 4 large suspended trams that were patterned after the Roosevelt Island aerial tram system from NYC, those unique cars could drop down a few feet in order to give the impression King Kong had hit it. The soundstage that housed the attraction was huge, covering 62000 square feet and standing over 6 stories tall. The entrance was themed after Penn Station and guests lined up inside in a gritty graffiti covered subway station. Set in 1976 New York, we see a special news report indicating that King Kong has escaped and has already destroyed two elevated subway trains. 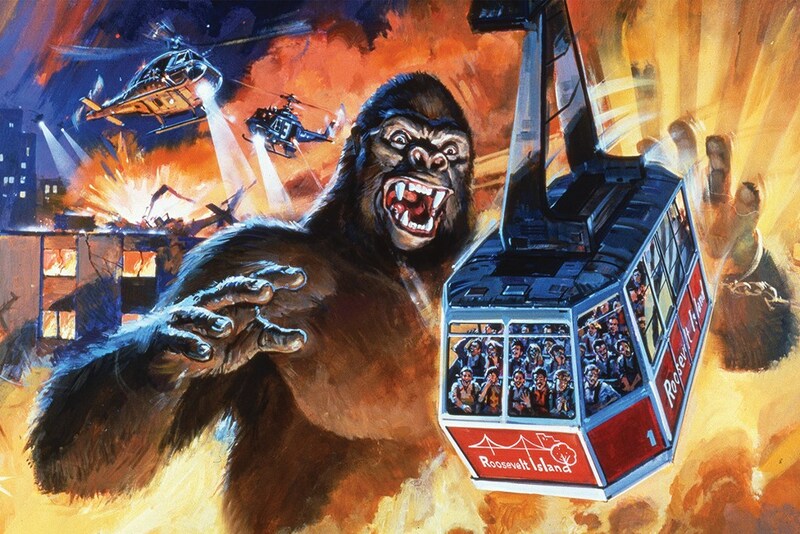 We are to be evacuated to Roosevelt Island using aerial trams and there should be no issues, as Kong is loose on the other side of town. The whole attraction takes place in a reproduction of New York, complete with 50 facades and various props. The entrance of the attraction in 1998. What you see on the left is the Islands of Adventure preview center. We board our tram and our driver makes sure the lap bars are locked in place. We are seated in multiple rows and locking doors complete the safety restraints. As we exit the station, our driver informs us that we should be safe and that we will tune the radio to the emergency police frequency. But… As soon as we leave the station, we hear on the radio an urgent call saying to stop all trams! King Kong is headed our way! Our tram is malfunctioning and does not stop and we then approach the first scene… where we see a police helicopter spotlight showing the silhouette of the giant Ape on a building. We then notice the horrific damage he has caused: overturned cars, broken steam pipes, water geyser from a broken hydrant, collapsed subway track with a car hanging down and more. Kong grabs a power pole and tips it toward us, causing it to explode. The power transformer blows up in a shower of sparks and sends huge blasts of fire. This also cause the subway car to catch fire and it also send flames from two hidden flame projectors toward the sky. A third flame projector was mounted to the left of the crashed subway and also sent out large quantities of fire. This montage from Universal Studios talks about the various Audio-Animatronics and show the various scenes. Steam from the pipes block our view ahead and it successfully hide our first meeting with King Kong. He is hanging from a bridge over the river and is very close to us. A police helicopter open fire on him and thanks to clever arm movement from the giant animatronic Ape, it create the illusion he swatted it out of the air. Then, a large explosion is activated behind the left shoulder of Kong and the radio completes the gag by saying that the helicopter has just crash landed. 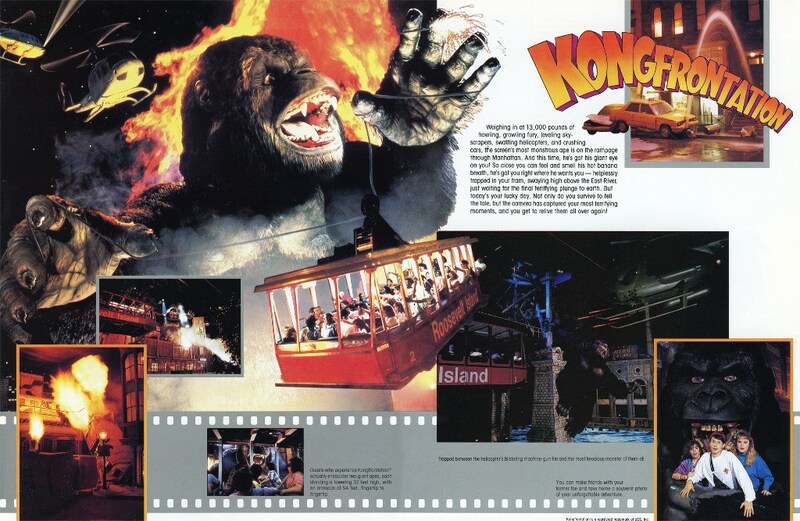 At that point, Kong has also “hit” our tram and thanks to the large on board hydraulic accordion system, our tram actually fall down a few feet as it moves forward, giving the impression we will crash into the river. Our driver regains control just in the nick of time and we go forward… A large section with no particular effects or sights is covered by the driver, who needs to act as if the tram is malfunctioning. We round another corner and we see that King Kong has cut us off and this time, he is standing inside a ruined warehouse. He again swats and grabs our tram. We then freefall toward the ground and our driver regains control just in the nick of time and we are then saved by another police helicopter. He open fire and this time, he is successful enough to distract him so we can escape. Behind Kong, the machine gun fire causes an electric substation to explode. We then reach Roosevelt Island Station and we see on TV screens in the tram our narrow escape over by the bridge. The attraction is one of the most complicated and technically advanced ever built. 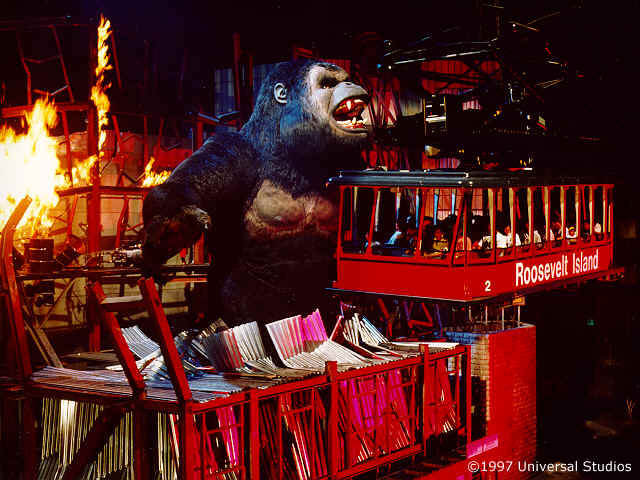 Both King Kong Animatronics required a very long testing phase in order to prevent them from touching the tram when they went through their motions. Also, they needed to have safeguards to protect themselves, as the Bridge Kong weighted more than 8000 lbs and the Warehouse Kong over 13000 lbs. So, in case of malfunction, catastrophic damage to the figures and trams had to be prevented. Another difficult design aspect was the fact that both figures would be very close to large fire nozzles. Both the fur and frames had to be fire resistant and the fire nozzles adjusted so that they would not shoot toward the large figures near them. Many pyro effects were included in the attraction to accentuate the destruction. Those, the Kong figures and the trams made the inclusion of complicated safety systems mandatory and those caused a lot of breakdowns. This caused the attraction to barely operate during its first summer and then, Universal had to tone down both the pyro and Kong movements in order to improve operational performance. By my count, Kongfrontation was the attraction that used the most individual fire effects in the world, a record that still stands today. 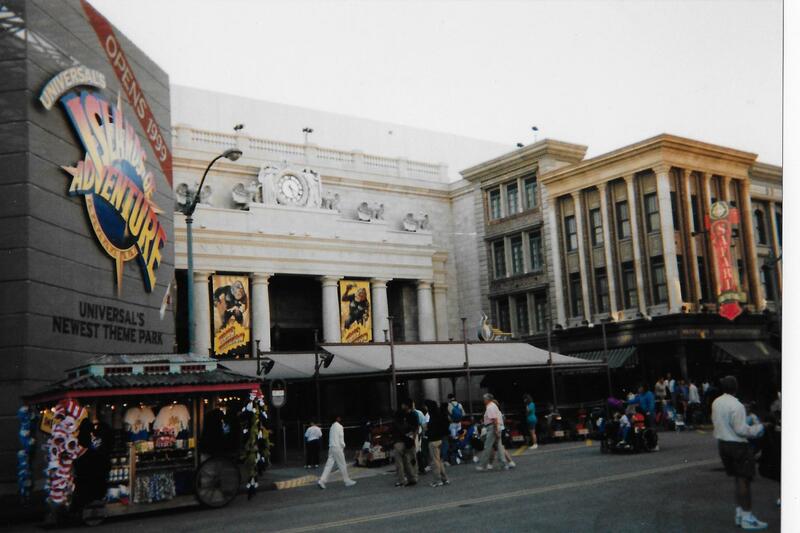 The attraction closed down on September 8th 2002 and was replaced by Revenge of the Mummy. We will discuss the Revenge of the Mummy in a later article, but it has kept the “fire” going inside the soundstage. This entry was posted in Special effect and tagged fire, King Kong, kongfrontation, universal studios florida. Bookmark the permalink.